In my last iPhone estimate, I had projected a total of 150-170 million shipments for the fiscal year 2013. This range was far lower than estimates from notable analysts, some of which exceeded 250 million. Apple reported iPhone shipments from the first half of the fiscal year (calendar Q4 2012 & Q1 2013) at 85.2 million, which is well in line with my estimate. This may be a good time to benchmark this analysis and update these projections. At 85.2 million, iPhone shipments for the first half of the fiscal year account for about 57% of the low-end of my full year estimate (150 million). In comparison, first half shipments accounted for 58% of full year shipments in fiscal year 2012. Based on this, our methodology has proved to be quite reliable. In the chart above, the "Launch Quarter (Q)" is the first full quarter after a new iPhone launch. The chart follows a familiar pattern I explained previously, i.e. QoQ growth sees a spike during a launch and tails off in the following quarters. Also, with successive iPhone launches, demand growth during the launch quarter has grown and demand growth in successive quarters has weakened. This is because replacement sales make up a larger proportion of iPhone demand, as a result of increasing smartphone penetration in maturing markets (a major long-term risk for Apple). 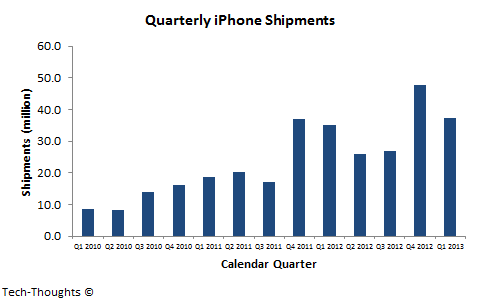 One interesting anomaly in the chart is that QoQ shipment growth in the iPhone 5's launch quarter was far lower than that for the iPhone 4S. The reason for this is quite simple - In fiscal 2012, Apple had introduced cheaper, subsidized versions of the iPhone 3GS & iPhone 4, along with the iPhone 4S. The pent-up demand in subsidized markets gave shipment growth a strong one-time push, which is difficult to replicate. It is interesting to note that the trend of declining QoQ growth has remained intact despite product mix shifting in favor of older iPhones. This makes me question the impact of the rumored, cheaper iPhone, at least in subsidized markets. 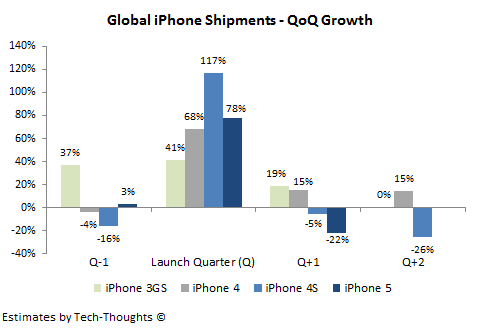 Another anomaly is that QoQ growth in "Q-1", before the iPhone 5 launch, saw 3% growth instead of a strong decline. 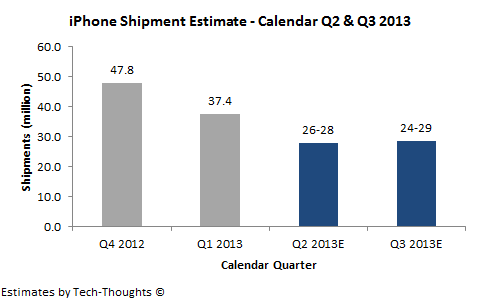 This was because the iPhone 5 was launched in the last couple of weeks of Q3, which helped shore up shipments. However, Apple could control this particular factor by timing the launch of the iPhone 5S. In all other cases, QoQ growth in shipments is far lower than it was the previous year, i.e. in the previous product cycle. Using the QoQ growth figures above with the iPhone's shipment figures for the past two quarters, we can come up with a more accurate shipment estimate for the second half of the fiscal year, i.e. Q2 & Q3 2013. If we assume that QoQ growth patterns for these two quarters will remain the same as the previous product cycle, then we get shipment figures of about 28 million and 29 million respectively. However, if we take into account the trend of declining QoQ growth with successive product cycles, we get an estimate of 26 million and 24 million respectively. The shipment estimate for calendar Q3 is heavily dependent on the timing of the iPhone 5S launch - A September launch puts it closer to 29 million, while a Q4 launch puts it closer to 24 million. Based on this, the iPhone shipment estimate for the full fiscal year comes out to 135-145 million which is slightly lower than my original estimate.